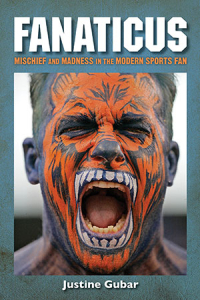 If you are interested in reading Fanaticus for your book club, feel free to email Justine. Direct sales at a discount and an author Skype session can be arranged. 1. For the person who chose this book: What made you want to read it? What made you suggest it to the group for discussion? Did it live up to your expectations? Why or why not? 2. What did you know about the subject prior to reading this book? How has this book changed or enhanced your view of the subject? 3. What did you find to be the most interesting events in this book? What, if anything, surprised you? 4. What do you think motivated the author to share her personal experience? How did you respond to the author’s “voice”? 5. What part did you find the most upsetting? Why? 6. How do you think the outcome could have been avoided during the Pacers/Pistons Brawl and for Bryan Stow? Do you think Fireman Ed made the right choice? Do you think the 49ers, the Raiders and the NFL approach the issue in a smart way? 7. How did you respond when the two former hooligans lament the past? Were you sympathetic? 8. What fan behavior do you think crosses the line and should not be tolerated? 9. Do you think banning booze at games would make a difference? 10. Do the characters in this book give you a sense that the issue is out of control or fixable? 11. Who if anyone impressed you as being attuned to viable solutions? 12. Talk about the writing style and language of the book. Was the language engaging, inflammatory, etc.? Did it draw you into the story or not? Were unfamiliar terms and concepts explained? 13. Have you learned anything new about yourself by reading this book? Please share. 14. Are you inclined to read more books on the topic? Why or why not?